There was a ball game, a glass sliding door, and a cocker spaniel with bronchitis. No, that’s not the lead in to a joke by some second rate comedian, rather those are the main components in this little ditty that I’m writing today. Like most creatures that are old Shadow has to relieve himself more often than most so my sister got up to let him and his younger dog partner in crime, Mocha, out of the house right around the time that Eric Chavez was digging into the batter’s box on the TV. I heard the glass patio door slide open and the dogs’ footfalls across the kitchen floor but nothing else as I was committing the ultimate sin and actually getting sucked into a Yankees/Red Sox game. The crowd on the TV cheered with enthusiasm as Josh Beckett delivered a beautiful curve ball right down the middle that froze the Yankee batter and ended the Yankees rally…and then another scream, not from the television but from the room behind me. The patio door was flung open and my sister was in the process of scampering, turning over her kitchen table and chairs in the process. She kept screaming it over and over again to which I could only reply “What is what?” as all I could see was her shuffling in reverse away from the door. 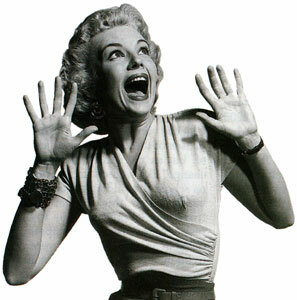 My big sister was now transformed into the little girl in the yard that gets grossed out when she saw a bug as she cried out “Ewwwww!” in a loud grown up voice. Now she means business. She’s grabbed the broom from the closet and is swinging wildly at this thing that I still have yet to see. My thought process at that point is that she has completely lost her flippin’ mind. And then finally I did see it. Dark. Menacing. Droning deeply. Bigger than a waterbug. Slightly smaller than a crow…making its way from the kitchen towards me the den. I didn’t know that we had these things in Georgia! What are those things called again? Sicily? No…that’s a city over in Italy. Cece Peniston? Nah…that was the cutie that sang “Keep On Walking”. Dammit, what are those things called? It’s right there on the tip of my tongue…oh yeah! 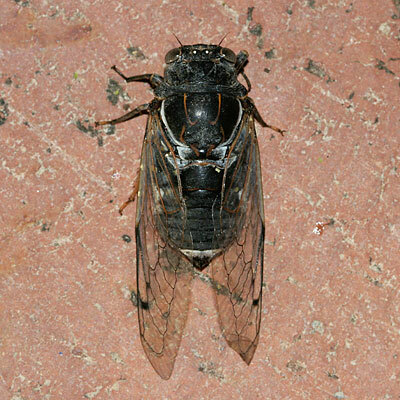 Cicada. That’s the word I’m looking for, or in this case, that’s the thing that I’m looking for…cicada. It was a cicada. About 3.5 inches long, great big wings, and when it landed on the end table it sounded like I dropped my keys on it, it was a big boy, or girl…like this. At this point she’s still doing a dance in the kitchen trying to shake the fact that the bug was just on her leg. The dogs are back in the house at this point after having finished their business in the back yard and Mocha is looking quizzically at the bug that’s sitting on the floor; she has that look in her Labrador eyes that says “I’m gonna chase that thing right there… then maybe even eat it.” She tilts her head then looks at the bug then looks at me as if asking me “Can I have it?” I’m pretty sure that if Mocha had eaten that bug my sister would have just fell out in the floor and died so I grabbed the broom from the floor nearby and shooed her away, just as I did that, the cicada looked about ready to take flight again but I couldn’t have that. I took the broom and doing my best lumberjack impression I went about hacking mercilessly at the thing. I’d smash it into the carpet and every time I’d raise the broom the bug would buzz in defiance. So I smashed it again…and again…and again…and again…each time harder than the last. My sister was screaming at me to kill it, Mocha was running in circles and jumping and barking, the glass patio door was still flung open so now every moth in Decatur was flapping around the florescent kitchen light. Shadow is deaf, old and oblivious to all of this; he was standing at the pantry door with the sniffles waiting on his post-pee dog biscuit. Finally it was done. The announcer was back from commercial and welcoming me back to Fenway Park where the game was tied and the David Ortiz would be leading off the Bottom of the 6th inning. I was sweating, books that were once on the end table lay scattered on the floor, Mocha’s tail was wagging furiously as she stood ready to pounce on whatever was left under the broom, my sister stood 15 feet away still not convinced the coast was clear. Shadow was still waiting on a dog biscuit with a runny nose. Soon order in the house was restored. The bug was swept up and disposed of, my big sister’s heart rate returned to normal, the patio door was returned to a closed position, and the broom/javelin was placed back in its place in the kitchen closet. I went to the closet and got two dog biscuits, one for Mocha for being a good soldier and being willing, I assume, to eat the bug to protect my big sister and me and the other for Shadow who was still standing there sniffling and snorting patiently waiting for his snack; then I reclined on the couch to watch the two teams I love to hate…but not before I grabbed the laptop and googled “Cicada” to see exactly what they are and where they don’t live so I can look for a nice place there. Falling out laughing whew. That reminds me of the time Sloe peeled off her clothes when one got on her LOL. Again, the you tell it makes it extra funny. Thank you sweetie you know I enjoy your work. Lisa…thanks for coming by and reading, hon. Appreciate it and appreciate you even more for sharing it! Thanks! I appreciate you coming by to give it a read. Don’t be a stranger…come on back through here! WEEKEND REWIND: Attack of the Whatchamacallit. Enjoy it!